Let me start by saying I'm sorry, it's me not you:) I've been working....allot. I'll try to post more often. Don't hate me. You've heard me say it before and I'll say it again, kids come with clutter! 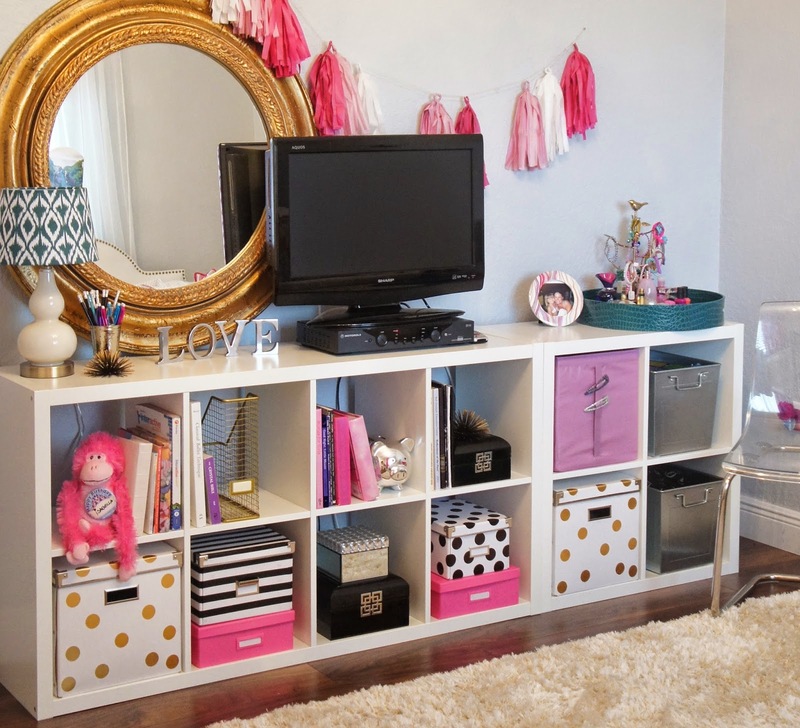 The key to kids rooms is to give them a place to put the clutter. Case in point is my daughter Isabella's room which has driven me close to the point of insanity. 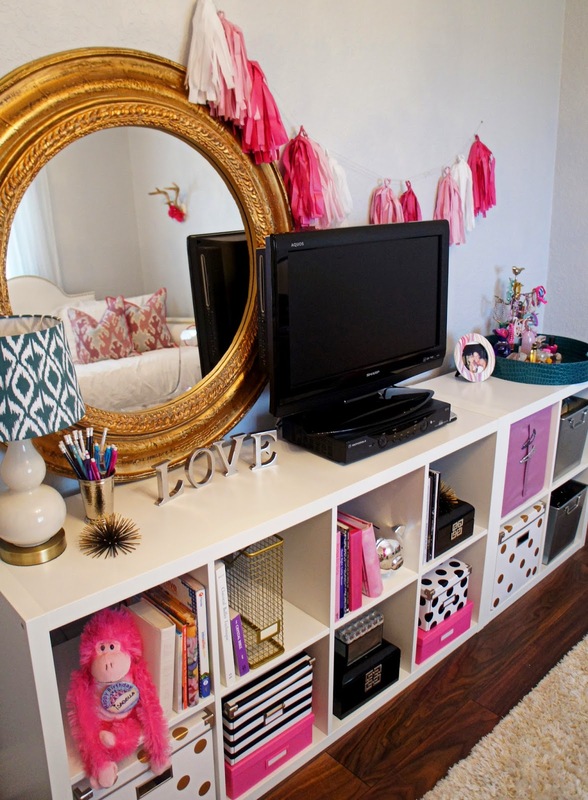 It is small and challenging, which is typical for kids rooms. For me the Ikea Expedit (now called the Kallax) has been great for organization and is a universal solution in most of the children's rooms that I design. It's compact, affordable, is perhaps one of the most versatile pieces EVER, and can be so chic when staged well. Case in point for todays post was inspired from the image below. 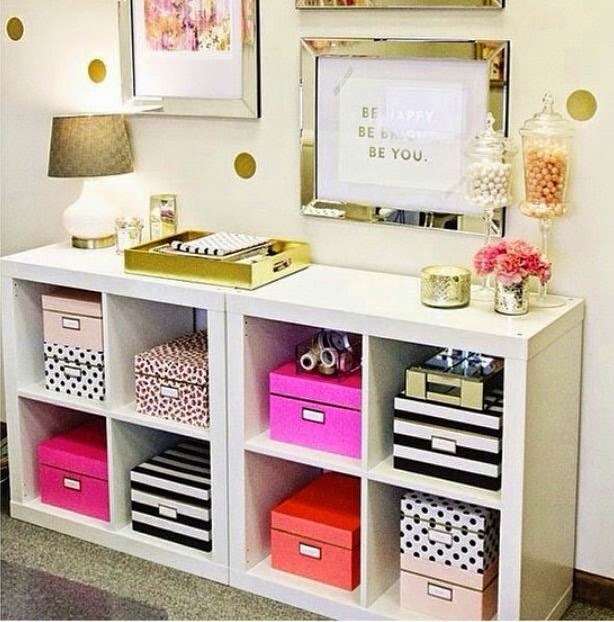 That Ikea unit is staged so beautifully with decorative boxes from Kate Spade and I wanted them! Sadly, at close to $60 for a set of 3 and the fact that I am a Crazy Designer Lady and change my mind (and my house) far too often I wasn't shelling out that cash for the amount of boxes I need. My solution was this crafty little tutorial that I found on The Decoist using the very affordable Kassett storage boxes which I already had from Ikea. Her tutorial was so simple. Take an Ikea Kassett box and electrical tape and wrap it. Use your tape as a spacer. Fast, easy and affordable. Check out her blog for a step by step. For the polka dotted boxes I had to be a little more creative. My solution was to take the Flatpack Decals Dots/Blocks wall decals that I found in a pack for only $9.99 from Target and stick them on the boxes. Yes, it really was that simple. The one problem was that there weren't enough black ones so I took a black Sharpie and colored all of the blue. Done! 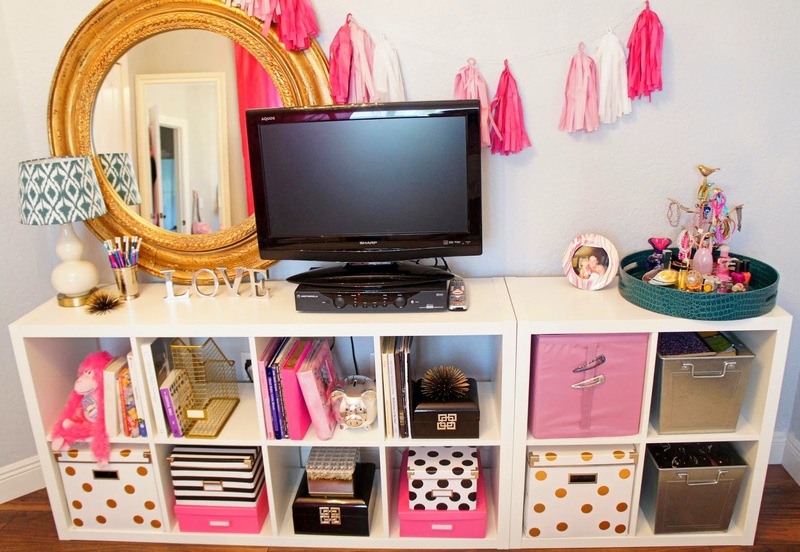 Here are my results for my DIY Kate Spade Inspired Storage Boxes in Isabella's room. 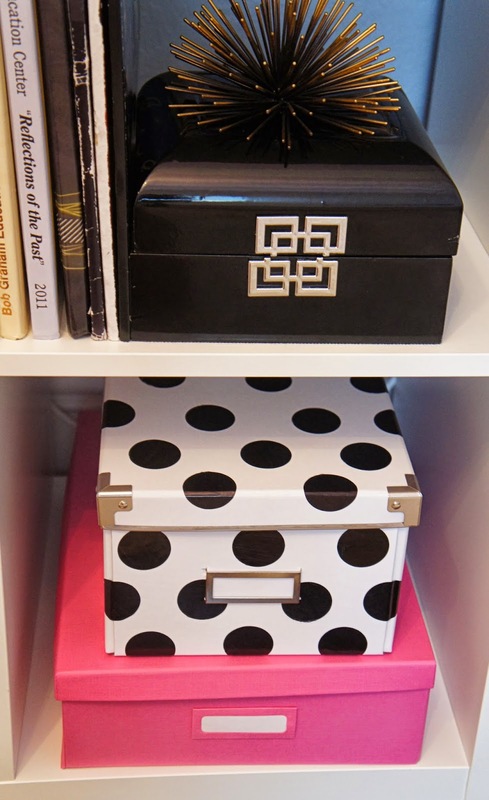 Here are a couple detailed shots for you of the DIY Kate Spade Inspired (easy as heck) Storage Boxes. I'm obsessed with the results! In case you are interested in any of the other items, I included a list of what was recently purchased (the rest are things I owned prior in my ever rotating house). Let me know if you're happy to see me again so that I know if I should keep making this blog a priority. It's been rough lately, but if you want the posts to keep on coming I will commit to getting them out there for you guys. I love my followers and I love your feedback! So happy to see you posting again!! 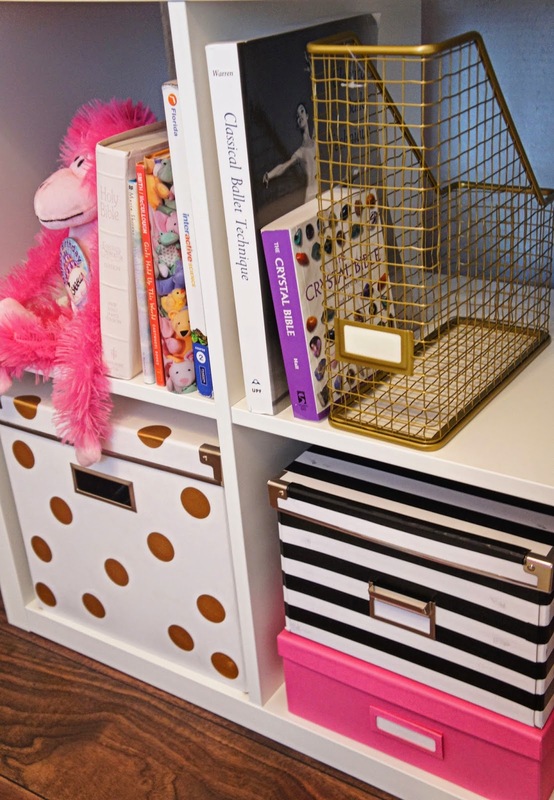 Love your blog, I'm in the process of giving my daughter a room makeover for Christmas, and I love this storage solution you've shown here. Looking forward to seeing future posts from you. I love to organize, and I love your photos. Happy New Year! So happy to read your new posts! What are those black boxes with the Greek key detail? I need those in my life!! Where did you get the shelf?? I've been looking for one like it, but haven't had much luck! Nice Blog Post, thanks for sharing. 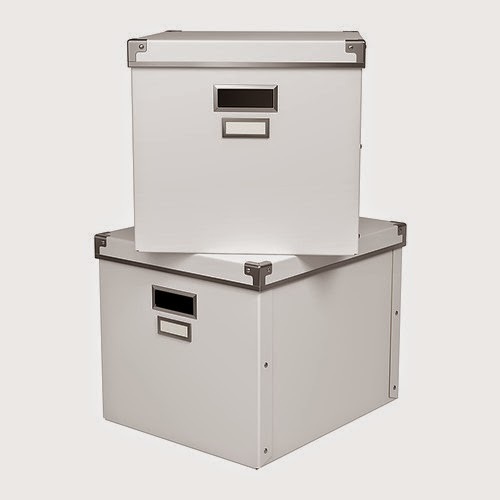 Storage box Auckland has your self storage solution with secure & safe storage spaces plus cardboard boxes, cartons and all your packaging needs.